Style's famous book, literary documentary about 1 man's journey through the world of pickup artists. 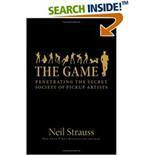 Written by New York Times best-selling author, Neil Strauss. Neil weaves together a fascinating novel about his experiences as "Style" in the community of pickup artists (all kinds of people known from this site are found in novel). Even though this book could be recommended on its entertainment value alone, it is one of the greatest examples of how to learn seduction. Throughout the book, Neil explains how he develops his technique, learning from all the greatest masters. Once you start reading this book, you'll need to reserve at least 3 days because you won't be able to put it down. Ever since this book came out, the seduction community has grown exponentially. This is probably one of the best books I have ever read. Period.